Going along the street of Lensoviet from the metro station Zviozdnaya, one will notice at a secluded corner, which is covered with trees a memorial tablet on the house number 62, with the inscription: “Ludmila Vladimirovna Rudenko, an outstanding chess player, the first Soviet woman’s world champion lived and worked in this house from 1976 till 1986”. When I happen to be at this district, I always come here, look at the face on the tablet and call to memory the episodes of our old and close acquaintance with Ludmila Vladimirovna. I was a frequent visitor here in the last years of her life, here I paid a last tribute to her. I saw her for the first time in the full blaze of glory in March of 1950 in the “Pioneer Palace” named after A.A. Zhdanov. 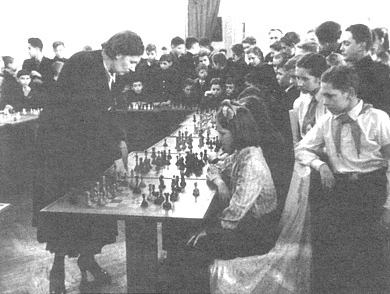 Ludmila Vladimirovna had just won the title of the woman’s chess world champion and accompanied by the world champion M.M.Botvinnik she came to the meeting with young chess players of Leningrad. Our citizens know the Anichkov Palace at the Newsky prospect that belonged to K.Razumovsky in the days of old. At that time chess hobby group was situated in the hall of the main building upholstered with pistachio green silk; now the chess players have moved to a wing of the Palace. The world champions went hand in hand up the grand staircase covered with stair-carpet. Children greeted them gaily, and also my face was among those excited faces. In the large hall among palms and other exotics there were porcelain-figures of green frogs described so precisely by Elena Danko in the book about the adventures of Karabas and Buratino in Leningrad. Also there were chess tables for simultaneous display. The display was made by L.V.Rudenko, M.M.Botvinnik and two Leningrad masters M.E.Taimanov and L.A.Shamaev. Ludmila Rudenko is making a display of multi-board chess-play in the "Pioneer Place" on 24th of March 1950. In the foreground there is Katya Bishard. A few words about my coming to the “Pioneer Palace”. I was taught to plat chess in a pioneer camp by a boy whose name was Sasha Chalik, it was he who sent me to the “Pioneer Palace” in September of 1949. Revekka Samojlovna Esterkina, a woman of extraordinary beauty, was one of the children's coaches at that time. Having played with me a training game and having seen how dashingly I moved first of all one Knight to h3 and the other to a3, she gave the final verdict: “You must play chess!”. And now I’m playing in the display with the woman’s world champion, I’m 11 years old and I’m in the forth grade. Strange as it may seem I won that game and in the newspaper “Leninskie iskry” was placed my photo with inscription “Katya Bishard is beating the championess”. After that I gave up chess and came to the “Pioneer Palace” as prodigal daughter, when I was already in the eighth grade. It happened that just at that time, in the summer of 1954 all-union competitions among women for the first time were held in Leningrad. L.V. Rudenko was the chief judge and organizer of those competitions. By that time she became a merited master of sports (1953). Ludmila Vladimirovna wanted the competition of such a rank to take place in one of the most beautiful places of Leningrad, and she arranged that the Anichkov Palace was given to children. The tournament had the scheme “semi-finals and final”. I played for Leningrad in semi-final and shared the forth-fifth places with Sveta Smekalova from Moscow for, but only first three places got into the final, I was lacking half a point. By the way the winner of these competitions was a Georgian school-girl Manana Togonidze, who afterwards participated in finals of women’s champions of the USSR for many times. From here thanks to good graces of Ludmila Vladimirovna came to great chess life such famous chess players as Alla Kushnir, Lusya Belavenets, Natasha Kolotiy, Rimma Antonova, with whom Ludmila Vladimirovna was on terms of familiarity all the life. But actually we made friends with her in spite of the large disparity in years in Volgograd, where a championship of a sports society “Trud” was held. We were living in one room, Ludmila Vladimirovna was constantly reading, especially at night and prevented me from sleeping. But these inconveniences were soon compensated: I understood how many interesting things I derived from the communion with her. Perhaps she was one of the few people, who influenced very much my development. I remember my irritation at the sight of the alight lamp and a book in hand of my roommate late at night. “What are you reading?” – I asked. “Great Gatsby” –Ludmila Vladimirovna answered. At that time few people heard about Hemingway, not to speak of Scott Fitzgerald, the great American writer. And then such a large flow of information poured out on me, such names sounded, such facts from the lives of writers, that my desire to take the first place in competitions turned into the desire to listen to her. What sort of a man was the first Soviet world champion that gained this title in 1950, and yielded it to Elizaveta Bykova in 1953, the world champion that never went out of the bounds of the USSR? I didn’t learn about that at once, but during all her life up to1986 she was sharing with me her thoughts and memories. Ludmila Vladimirovna was born in town Lubny of the Poltava region. Her father Vladimir Andreevich was the State Counselor. The girl went to a grammar school. After the civil war her father was a public prosecutor of the town Nikolaev, struggling against homelessness, and then became a priest. The revolution dispersed the family about the country. Ludmila Vladimirovna came to Odessa, where she studied at institute and was qualified as an economist-engineer in normalization. There a circle of her friends was formed, famous writers and literary men, with whom she was keeping in touch all her life. Among them was Sergej Bondarin, her constant partner in chess game. Among them also was Nikolaj Kharjiev, who composed and prepared the text and the commentary to the collection of poems of the great poet O.Mandelstam who was subjected to repressions, the collection appeared in the series of “Poet’s library” in 1974. Ludmila Vladimirovna had a lot of friends, because she was many-sided person. In Odessa she went not only in for chess, but also in for swimming and became the champion of the town in breast-stroke in open water. Her life wasn’t simple. She moved from Odessa to Moscow and then to Leningrad. There she married a very famous scientist Lev Davidovich Goldstein, the founder of the department of cybernetics in the military academy named after Mozhaisky. Until now there is a memorial tablet devoted to him on this building. In 1931 Ludmila Vladimirovna bore the son Vladimir. She was playing chess, she was bringing up her son and working at a printing-office. It was a severe time. A typographer typed “to smoke…” instead of “to buy books of Lenin and Stalin”. It cost him his head. Ludmila Vladimirovna urgently quitted from the printing-office. The war broke out and she entered armament factory, which was evacuated to Ufa. However the children of many workers of the factory were left in Leningrad. The director gave to Ludmila Vladimirovna a passage mandate in order that she could evacuate children. She couldn’t explain herself how she did that, she formed a special train by superhuman efforts and managed to evacuate children before the ring of the blockade tightened around the city, and then collapsed with nervous exhaustion. Her feat was described in details in the book “Women-communists in the Great Patriotic War”. Ludmila Vladimirovna considered the rescue of children to be the most important deed in her life. After the war L.V.Rudenko completely devoted herself to chess. Her coaches were the famous chess players and racy persons, grand masters Levenfish and Tolush. I will not labour a point of her brilliant chess achievements – there are many materials on this subject, but I want to tell more about an outstanding, extraordinary, controversial and near akin to me woman. When my son Slavka was born, Ludmila Vladimirovna already couldn’t go out of the house on health grounds, but she sent a telegram to my address, which I’m keeping until now: “enjoy good health and love your mom. Your friend, Luda.” She loved people, received guests hospitably and kept an open table. When chess players from other cities came and had no place to stay, she spread a big carpet on the floor so that everybody could sleep. She was hot-tempered, liked the process of playing and the result. She played well not only chess, but also bridge. She enjoyed talking about books and painting. She had an excellent library, the books were alive for her. She liked to present them and lend for reading. I remember her story of how she went to Moscow in one compartment with a man and a woman. She was reading the book by historian Scheglov about Pushkin (pre-war publication). Now it is republished, but at that time the book was rare. The woman was looking at her from time to time and at last asked the book to read. Certainly, Ludmila Vladimirovna lent it to her and gave her address in Leningrad. How surprised she was, when she received a parcel with that book from Moscow and a grateful letter signed by Ariadna Efron. It turned out that her traveling companion was a daughter of the poetess Marina Tsvetaeva. Her favourite museum was Russian museum. Her last excursion there was with me. There was an exhibition of an outstanding Russian painter-emigrant Saveliy Sorin. I had already seen it and wanted Ludmila Vladimirovna also to see it. But how to do this? She already hardly walked. I with my husband took a taxi, brought Ludmila Vladimirovna down by elevator and put her into the car. Until now I remember her bulky body with outstretched arms and her voice: “Finally I’m at home!”. After that she didn’t go out any more, sat at the balcony and was talking with her friends: Luba Kristol, Flora Dmitrieva, Hilya Vainer and others. 2004 is the year of centenary of the first Soviet woman’s world champion. International woman’s chess tournament is held in Petersburg in her memory. Young chess players take part in it, they play, they play in a new way, advocating new principles. They haven’t seen Ludmila Vladimirovna while alive, she is a symbol for them – world champion. Yes, she is a symbol, symbol of the past epoch, embodiment of its best features. I express gratitude to the grandson of Ludmila Vladimirovna named Serezha for the presented material.